One reason that LCD monitors have become so hugely popular is that an office always sets a premium on real desk top space. Any item that can reduce the hardware clutter from a cubicle desk will be embraced by the business world. Which is why when a design comes out to minimize the desktop footprint of a printer, it’s bound to turn heads. 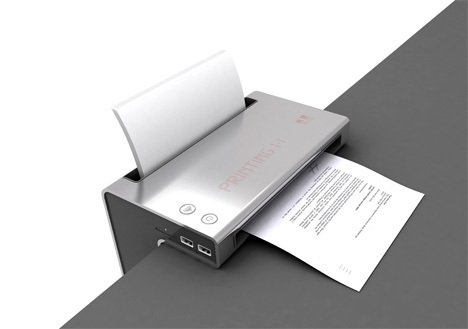 I’ts another great find from our friends at Yanko and it’s called The Hanging Printer. 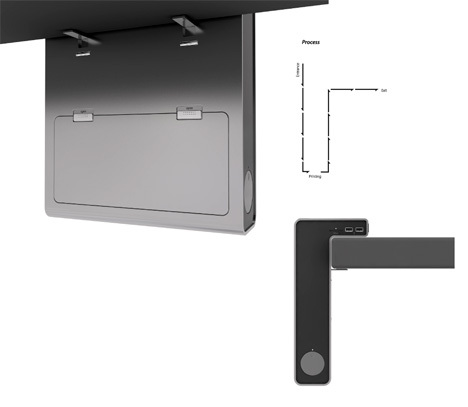 The basic idea is that the business end (the print head and paper feeder) of the printer takes up the space it needs on the edge of a desk while the main guts of the device hang off and below the edge. This means that paper doesn’t need to take up space above the rim, but can be fed into the printer head area through an intricate arrangement of wheels and belts. The result is cool, form fitting, and occupying a small amount of deskspace. And those who worry about it falling off can make note of the cleats underneath that help the printer to grip around the edge to latch it tightly to the desk. Two USB ports make for direct connect to your PC (although a wireless option would truly make it clutter free) and an embedded LCD to indicates printing status and error messages. No word on price or availability, but for the space saving capability of this design, it’s worth it’s weight in corporate gold.